When DSD music downloads were starting out – with the Channel Classics catalogue as one of the pioneering sites 3 years ago – there were a limited number of choices when it came to audio equipment to play these files. Things have changed quite a bit since then. Today, there are over 280 Digital to Analog Converters (DACs), Mobile Music Players and Music Servers that can play these music files. In some cases, this includes both Stereo and Multichannel DSD playback and with resolutions of DSD 64fs (single rate DSD) all the way up to DSD 256fs (quad rate DSD) and in some cases even 512fs (octa rate DSD). These products are also available in a wide range of prices – starting at $99 for a DIY (do it yourself) DAC kit to $74,950 for a cost is no object DAC. 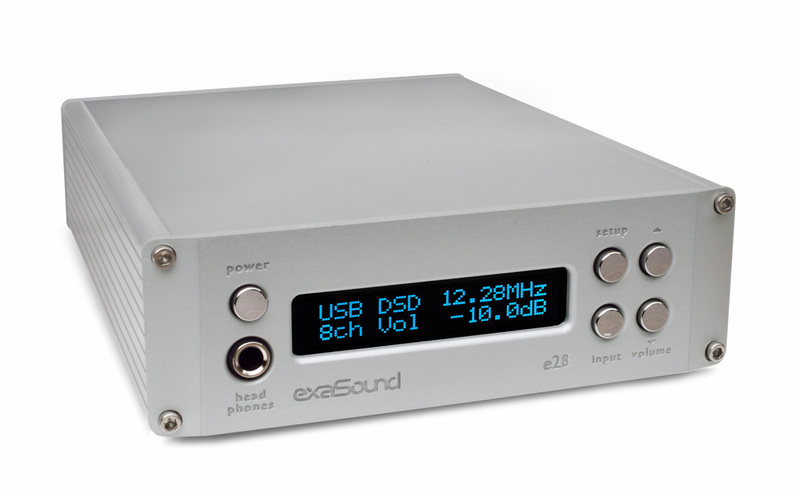 One DSD DAC of note, exaSound’s e28 8-Channel DAC (see picture) handles every DSD Download available on our site – Stereo & Multichannel, DSD 64fs, 128fs, 256fs and even DXD for $3,299. Worth a listen if you want to play any or all of our music downloads! For more information you may also want to read Ted Brady’s detailed REVIEW. A recent discussion on the web concerned ways to view and edit the metadata in DSD music downloads. Downloads stored in the *.DSF format, like you will get from Native DSD, include metadata that lists the song titles on an album, the artist name, album name, music genre, length of each track and a color image of the album cover (among other information). Picking up a software program like Tag & Rename ($29.95) from Soft Pointer will let you open music download files, view the artwork and metadata and even edit and add to the metadata. Very handy. Other programs recommended by music fans for editing your music download file metadata included MP3Tag as well as music download player software like JRiver Media Center ($49.95) and Foobar, a free software program. One of the important behind the scenes people at Native DSD is Tom Caulfield who runs the Native DSD Mastering Room in the U.S. A veteran recording and mastering engineer, Tom is responsible for taking DSD Edit Master Tapes from our partner record labels and preparing them as track by track DSD music downloads. Tom also drops by some of the audio and music forums on line from time to time to answer questions about music downloads and DSD using the handle “Tailspn” – a reference to Tom’s adventures as a pilot. In a recent on-line discussion, one music fan was so grateful for his help that he included in his reply “Thanks, Jared”. That moment had the Native DSD team laughing since Tom is our mastering engineer and Jared (Sacks) is the Director of Native DSD. As you can see by the photos above, Tom and Jared are unlikely to be confused in person – even though both are very knowledgeable about DSD. But online, anything can happen. A question we receive from time to time comes from owners of the extensively featured Oppo 103 and Oppo 105 Universal Disc players. These players handle video discs (DVDs and Blu-Ray discs) along with many types of music discs (CDs, Super Audio CDs and DVD Audio discs) and even music downloads. The Oppo 103 and 105 will play DSD music downloads in the DSD 64fs (single rate DSD) format in both Stereo and Multichannel DSD. To do this, you simply connect a USB Hard Disk with your music downloads to any of the three USB inputs on the Oppo 103 or 105 disc players. (All of the Oppo 103 and 105 series players have 1 USB input on the front panel and two USB inputs on the back panel marked “USB 1” and “USB 2”). In addition, the newer Oppo 105D and Oppo Japan 105JPD models handle both DSD 64fs (Stereo and Multichannel) and DSD 128fs (Double Rate DSD in Stereo only) music downloads using a different approach. Instead of using one of the three USB inputs on the 105D and 105JPD Oppo players (usable for DSD 64fs only playback), you will connect a computer running music playback software (like JRiver Media Center) to the Digital Audio Input marked “USB DAC”, just like you would on any Digital to Analog Converter (DAC). This enables the Oppo 105D and 105JPD players to play Stereo and Multichannel DSD download files at DSD 64fs or Stereo DSD download files at DSD 128fs – opening up even more musical choices to you! As you can see, the Oppo disc players are a very affordable way to get started with DSD music downloads – and it is often a disc player you already own!